3 Steps to Restoring Sanity: how to move from frenzy to freedom. I am going to suggest something revolutionary. It’s not that you don’t have enough time, its that you have too many distractions from what really matters. If you have ever opted to stay in and binge watch TV, rather than go out or visit with friends, then I’m talking to you. If you’d rather play on your iPhone than play a board game, then I’m talking to you. When did it all get so crazy? You need a brain break, bruh! Step 1. Clarify your values. What do you really care about? I don’t mean things you know you should care about, or things you feel bad about not caring enough about. What makes your heart sing? Do you really afford yourself enough time to do the things that make your soul shine? If you put first things second, you will never have sanity. Personal Example: I love to read. I love to learn new things from people I admire. I really like to sit with a book in my chair, and get lost in the pages. But, I get busy. Recently I have substituted reading a book for listening to an audio book while driving. Guess what? Its not the same thing! Reading a book in my chair is relaxing, while listening to a book on tape while careening through traffic, while invigorating and informative, is not relaxing. Know the differerence. Personal Example: My dining room table also doubles as my workspace. Bad idea! I don’t have an office at home, but I work from home on my various projects. I wish I could tell you that I always keep my dining room table free of clutter, the laptop, car keys, etc. The truth is most nights I have to clear the table before we can set the table for supper. By creating a defined workspace, or setting certain hours in which I will and won’t be using the table, I solved this problem. Step 3. Enlist your crew. Parents these days don’t seem to know how to get their kids to help out. One child psychiatrist did a study that found that %80 of the parents who JD chores when they were kids do not give their kids chores. What gives? She says that most parents think it will take too long to teach the children how to do the chores and oversee them. Unfortunately, she concludes, this leaves the parents overworked and the children incompetent. If you don’t have kids, you still have a crew. They can’t be enlisted for chores, but they can be called upon for help. Don’t be afraid to ask a close friend to lend a hand, and be willing to lend one back. Personal Example: My mother taught us the “post office game”. It seems she and her sisters were given a clothes basket and told to pick up all the mail (items strewn about the house). The siblings went around picking up the house, then they had to “deliver” the mail to the correct addresses (trash went to the bin, shoes to the closet, etc). It felt like a game, but the house got cleaned. Win-win. Bonus Step: Make peace with God and others. Clarifying your values and putting first things first, should mean squaring accounts with your Creator. Connecting with God, having your conscience cleansed, and knowing that you are right with God and men brings a tremendous relief to the souls and mind. It restores sanity. Personal Example: Each morning I take a few minutes to pray, tune my heart to God’s priorities, and read a devotional. I feel energized and directed. It clears away the mental and emotional clutter of yesterday, and gives sets my course for the day. Having oneself in spiritual balance, makes for a liberated existence. The bottom line is it up to you. You make the changes, that you want to see in your life. No one else can do it for you, but you can call on the Heavenly Father for His guidance and instruction. Every ex-little leaguer is familiar with the admonition to “Show some hustle out there!” This was usually accompanied by the obligatory three claps, and then your coach would clear his throat and expectorate a mixture of spit, phlegm and tobacco juice*. 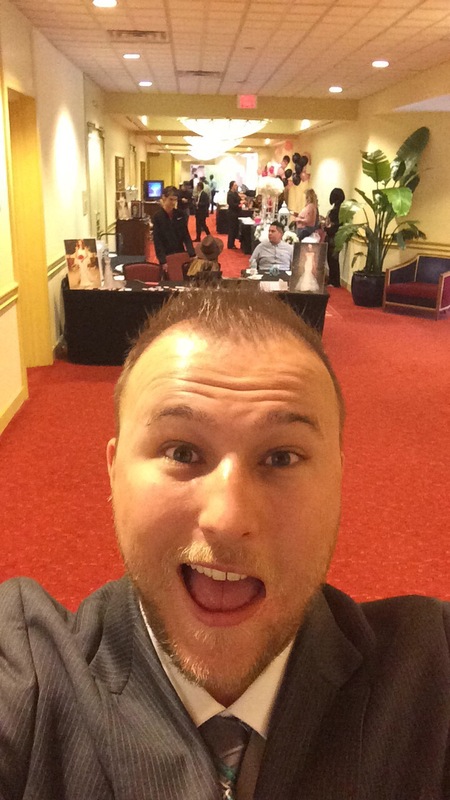 This is me hustling at a wedding show! Actually, it was quite a nice time. I talked to hundreds of people, had a few laughs, and got some business too. I’ve been thinking about hustle lately. For most American adults, hustle means taking life seriously. It’s about working hard at your job, keeping your self present in the life of your wife and kids, and diligently doing all the little life things that makes the world work. You have to hustle to keep your head above water. Many of us are afraid that if our hustle fails us we’ll flounder and sink. Some people have checked out of the hustle altogether. Checking out is the same as losing. Chris Guillebeau, who hosts the podcast “Side Hustle School” says it this way. A hustler is the synthesis of a charlatan and a martyr. A charlatan is all talk and no action. A martyr does all the work, but isn’t willing to advocate or advertise his message. It’s style without substance, or substance without style. But style with substance equals impact. Being a hustler is being willing and able to talk about the work and deliver the goods. I think Christian’s should be hustlers. I’m an entrepreneur. I own businesses, and I’m on the Godly Culture crusade. For me hustle looks a little different. My livelihood is derived from keeping my customers and readers happy. If I fail to deliver immense value, then I run the risk of losing business. So, I choose to hustle. As a Christian, I know that I am supposed to be the hardest worker and give the most effort, resulting in supreme value. I choose to crush it and make sure everybody gets a chance to join in the mission. Example: A Christian can be an excellent house builder, but that’s only half the work. He also needs to be able to sell it. What if the amazing home he just constructed just sat there empty? What good would that do? So, he has to build something amazing, then tell the world about it. This is how good becomes great! Hustle looks different even between how I split my time between ministry, family, work, and Godly Culture. But, the elements are pretty much the same; outperform and spread the news. Spreading the news gives others the chance to benfit and join in. Side note: We have to teach our children how to hustle. I’m seriously concerned about today’s kids. As Christians and hustlers, we will be held accountable for our lazy kids. And, they will not be able to uphold the biblical mandate to “work that which is good with your own hands, so you have something to give...”. In all honesty, my wife puts me to shame, when it comes to hustle. My wife is the biggest hustler I know. It seems like her ambition is as limitless as her energy and love of life. I’m not ashamed to say that I’ve learned a lot from her. She comes from a long line of entrepreneurs… like 500 years long. We did her genealogy and found out her ancestors have been farmers (which is the quintessential small business) for 9 generations. That’s hustle! Your hustle muscles are in your creative brain, busy hands, and motormouth. You’ll need a hammer to build with and a megaphone to project your voice. My basic point is this, don’t be a charlatan and don’t be a martyr. Do be better than the next guy, do tell the word about it, and do deliver the goods! Get out there and hustle! *I did have a coach who habitually chewed Copenhagen. It’s a gross habit, but they weren’t allowed to smoke in front of us kids. I guess he had to do what he had to do. **Yes, some of them actually did call me by the wrong last name. Was it carelessness or intentional neglect? I will never know.